Is it any wonder that it has taken vocalist Amanda Somerville seven years to return to her Trillium project? She's been busy contributing her voice to ninety percent of European symphonic melodic metal bands, from After Forever to Xandria. But now she returns to her three-petaled flower musical project with Tectonic, with her husband, guitarist Sander Gommans, by her side. Once more Ms Somerville returns to the genre she knows best, melodic heavy metal with symphonic synth embellishment. Expanding that a tad more, you can expect mixed pacing, with tempos from steady heavy metal to swift power metal. Also, the rhythm section delivers plenty of rock groove, and the bass line is significantly heard in most songs. Of course, perhaps the sin qua non of true heavy metal, there are plenty of crisp and soaring guitar solos from Gommans, but also Trillium live veteran, Paul Owsinski. Completing the circle, as a vocalist, Ms Somerville has some significant range, singing melodic with both power and restraint. There's always clarity, and never a breath of straining in her presentation. Here's a few song highlights to pique your interest. Something of personal inspiration comes with Time To Shine and Stand Up, both rather uplifting metal songs. The former features a light vocal breakdown for Somerville after the mid point. The latter song offers bracing riffs, rock groove, and a killer chorus. With Nocturna, you get something of a heavy metal anthem, where light parts, often with the vocals, intersect with more heavy parts. I also thought, through the vocals, the song had an almost operatic feeling. Within Shards, you'll hear almost all those aforementioned musical elements mentioned in the previous paragraph. But most notable is the keen rock groove and the bristling guitar work. The album closes with a simple symphonic ballad where Somerville sings mostly over piano, sending chills down your spine. All said, Tectonic is quintessential Trillium, with Amanda Somerville once more stunning us with her beautiful voice in the context of the symphonic melodic metal she loves. Easily recommended. 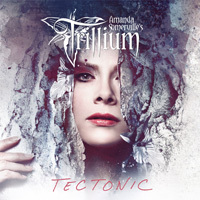 Tectonic is quintessential Trillium, with Amanda Somerville once more stunning us with her beautiful voice in the context of the symphonic melodic metal she loves. Easily recommended.